I am no longer maintaining this AddOn! The functionality of this AddOn is now part of Deadly Boss Mods. This is here only for historical puprposes. 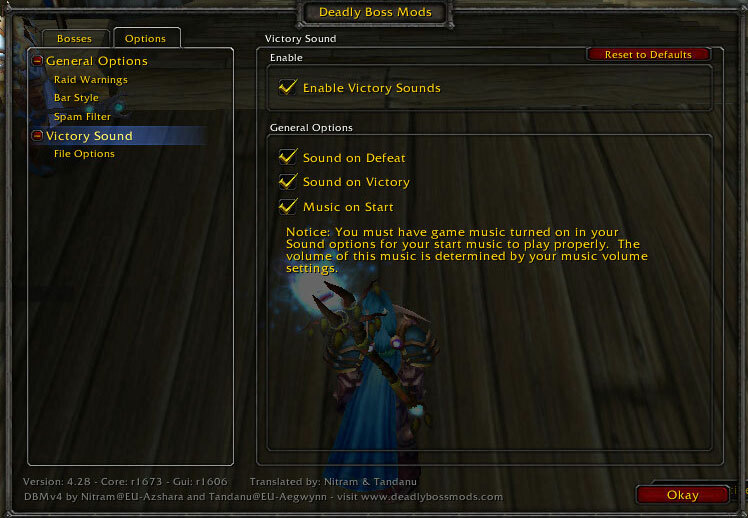 I'm wondering why DMB base mod only has the two options for victory sounds. I'd really like to have matching victory sound themes to match the options for starting a boss fight and the different voice over options if there's a wipe/fail. e.g. The "you...will...die" option that we can choose and have play when the boss fight starts being matched up with a similar voice over victory sound. Someone! Anyone! Please update for Legion! Since the newest update to 7.0 Victory sounds doesnt play its in battle music and the victory or defeat repeats like 3 times. Can we please get an update soon? I love this addon, its one of my favorites. Hi! I just submitted a new version that works with the last version of DBM and WoW. It should be available once it gets moderator approval. Sorry it has taken a while. I've been busy and this project got backburnered, severely. Good news is I fixed the addon. It is now working as it did before with the latest version of DBM. Version 2.0 should be available once it gets moderator approval. I made a fix for "DBM-VictorySound 1.9" to work with 6.0.2. Someone please pickup and update this addon for 6.0.2 and beyond. This is literally my favorite addon and would love to have it working for Warlords of Draenor! First I wanted to say thanks for that wonderfull addon.